Even though Gibson is their parent brand, the best epiphone guitars they made can be compared directly with some lower-end gibson models. With almost 150 years experience in the guitar making industry, innovation has led this brand to deliver steadily and continuously in the market of producing remarkable acoustic guitars. Their traditional designs are envied by most of the companies – or especially from Gibson which went on to buy this company in 1957 – and their new designs live up to the established title and character. Their support of newly manufactured guitars is something that definitely makes this brand noteworthy, and with a lifetime assurance of reliability that brought them from a long way, you know these old timer impressive instruments are built to last. Their beginning goes back to 1873, they began as an independent musical instrument producing brand, somewhere in the part of the modern day Turkey, creating stringed musical instruments such as violins and lutes, by the year 1903 they went on to change their destination and market totally by relocating to the United States. By the year 1928 they rebranded the company and at that same year, they began making a broad variety of noteworthy stringed instruments. Respectively, this year marks the year they began their lifelong journey of making acoustic guitars. After a few years, particularly speaking in 1957 this name was sold to the Gibson company, operating at a high level of the industry. Today they offer most of the alternative versions of Gibson masterpieces such as their exceptional take on Epiphone Dove-PRO as well as their own compositions which involves the exceptionally thriving entry-level acoustic guitar the Epiphone DR 100 which we are going to talk about furthermore below. Epiphone excels at providing the market with a diverse broad list of acoustic guitars, their well-known craftsmanship has led to manufacturing the Epiphone Hummingbird which honors the playing style of blues, this chosen icon shows off a touch of fabulous retro fashion, with a polished pickguard and is coated with the Cherry Burst among other peculiarities. Nowadays, as you may already come to terms with the fact that the music industry is oversaturated and has grown excessively, with everyone trying to supply the market with top caliber instruments you’re bound to discover that there are going to be some acoustic guitar brands that are more noteworthy than some. Some tend to offer only one type of instrument and others are trying their best to produce as many types of instruments to provide each field with their unique touch of excellence. Amongst many of these popular brands, a brand that has established their worth in the music industry is Epiphone. This is a highly respectable name when it comes to manufacturing musical instrument, their reliability goes beyond words, with years of experience in the industry of musical instruments they earn their well-earned status as one of the greats. 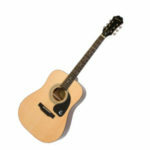 This brand is especially well known for producing guitars of great quality and quantity too. You will discover in this briefing that Epiphone offers a broad series of acoustic guitars, they also produce electric guitars too but our main focus will be their acoustic lineup. If there are few things that Epiphone excels at producing quality guitars it is because of their durable structure of which the guitars are mainly made. If you’re just starting out to learn to play the guitar then Epiphone is the right option. Even if you’re a pro player who wants to get a hold of a high-level guitar, then Epiphone got you covered. Which is the Best Epiphone Guitar? We can’t start this best epiphone guitar list without mentioning the DR-100. In the middle of the spectrum of entry-level acoustics and high quality you have the DR-100 provides you with more than what you buy for, this beginner-friendly guitar is an excellent example of just that. even if you’re a pro-level guitarist this acoustic is bound to be suitable for your traveling purposes so you don’t get to leave your beloved guitar at home anymore. While it may not produce the kind of powerful sound you would expect from a full sized dreadnought it still delivers a rich tone which is going to fill your performances with entertainment. Acoustic instruments usually are more fairly-priced and the one we are speaking of here is one of the fairest alternatives that delivers a remarkable performance. If a well-equipped guitar is what you’re looking for then in DR-100 you are bound to find so many features that will amaze you. It’s robustly built with great craftsmanship that is always shown to be of the highest quality. The structural strength further enhances its vitality and durability. Judging by the great response, its effective functionality and great stability, together they make the DR-100 an outstanding choice for the new players who are starting their first steps into learning the guitar but also the ones who’ve made a consistent hobby out of playing the guitar. 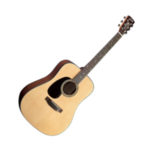 A beautifully decorated acoustic which makes use of durable wood materials that enhance the sound quality is what everyone could expect from a guitar in this price range. This guitar is manufactured to produce a rich tone; the top spurce assists into making that possible, and the back and sides are made of solid mahogany. Moreover, the rosewood is applied on the fingerboard and the added headstock is there to render enhanced tension at the head of the guitar. In conclusion, the DR-100 acoustic guitar produces the startling sound essence that is hard to find at such a fair price. Do you see yourself as a skilled guitarist? If so then you probably know the most suitable guitars that fit your style. Even so, as a guitar player, you can never get enough guitars for your collection, we always end up looking at other guitars at the store in great awe. Furthermore, we are going to do the just that, today, we are going to take a look at this legendary guitar made by Epiphone, The one and only The Hummingbird PRO. If you are looking for a high-caliber guitar than this is the best option you can come to terms with. This model manufactured by Epiphone is made to produce the outstanding performance everyone craves. Its simplicity in structural design contributes toward the ease of performance, and the extraordinary development in this guitar makes up for a perfect choice. Regarding the appearance, this guitar is one of the most fashionable options in the Epiphone series, the artfully designed pickguard this guitar delivers a touch of elegance like no other guitar could. The body of this guitar is decorated with maple wood materials and a spruce top. The typically polished rosewood is placed on the bridge and fretboard. Moreover, this guitar is equipped with phenomenal electronic hardware that allows you to plug it in and perform on the spotlight. The Groove turners allow for a manual intonation without any problem with the tightness of the strings. Epiphone EJ 200ce is the Gibson’s way of paying homage to the legendary guitar Gibson J-200 that is included in the top list of the most remarkable guitars to be ever made. Its pleasing aesthetics are related to the J-200’s and the tone is well worthy of the legacy that guitar carries. This renowned design comes with a stable set of electronics which pushes the traditional design into the new era of modernism. This guitar rocks the Jumbo body type, while these body types may not be made to be as compact as their dreadnought line may be, but nonetheless, the big size Jumbo body types provide, delivers an extra powerful volume that many of the guitar players are after. What makes this guitar even more remarkable is the classy cutaway design which makes a tremendous difference when it’s applied to a Jumbo bodied guitar. This alteration alone makes it more suitable for the strummer to travel through the frets easier. The selection of tonewoods is a combination of maple wood used for the neck, back and the sides and , meanwhile, the top is made of solid spruce and the fretboard typically is made out of rosewood. In term of appearances, this beautiful timeless instrument is just astonishing. Regarding the hardware, most of the acoustics that are manufactured share a similarly comparable type of hardware, this is not the case with the EJ 200ce. With this guitar comes a unique type of tuning machine, here Epiphone instead of utilizing a set of Epiphone tuners, they decided to us Grover’s tuners which magnify the sound quality and intonation. 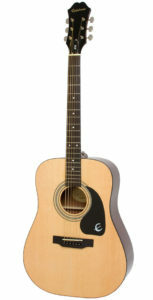 In conclusion, Epiphone EJ 200ce delivers a powerful sound, given that this is a jumbo acoustic guitar. Its selection of tonewoods delivers a very durable foundation that contributes to giving the player a vibrant tone. If you still can’t decide, you can read a detailed review of the Epiphone EJ-200SCE. As we go further into discussing noteworthy acoustic guitars we are climbing into the remarkable end of affordable guitars and one name that is mentioned repeatedly on this end is Epiphone. Although Epiphone is mostly correlated with the entry-level industry of guitars but with their DR 500MCE acoustic-electric guitar is taking a big step up. This guitar is well equipped with flawless substantial wood materials, it has a well-polished vintage design and spotlight-worthy electric components. 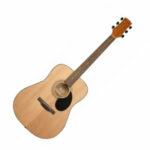 This dreadnought-shaped guitar flaunts a single cutaway design and is entirely made of durable wood materials. Featuring a Sitka spruce top combined with substantial mahogany wood which is used for the back and sides. This guitar comes with two color alternatives, one has a touch of polished vintage sunburst and there’s also the natural version of it if the sunburst is too decorated for you. Its neck is finished with mahogany strapped in the 14th fret of the board, this contributes to making a bit faster for the players to travel from fret to fret and more comfortable to get around the chords. Being appealing to look at this guitar is also equipped with sound components that give this guitar a touch of elegance. On the beforementioned headstock stands the Grover device and the chrome tuning keys, just below that is a bone nut, furthermore is the rosewood bridge and the bone saddle. This acoustic-electric guitar utilizes an eSonic-2 Stereo preamplifier which is highly suitable when you have an upcoming gig you want to rock at. This guitar comes with two pickup systems one being under the saddle which is Shadow’s NanoFlex pickup and the NanoMag pickup system is installed at the fingerboard end. This is accompanied with a proper command panel which provides control for the tone of the both pickups, a stereo blend and a phase switch. 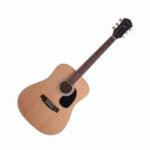 Overall this guitar has a powerful acoustic sound and its robust built contributes to making this guitar a durable one. Even when this guitar is unplugged is still produces a persuasive sound quality and adorable tone thanks to both pickups that are installed in this guitar you can adjust the sound that fits mostly to your style. 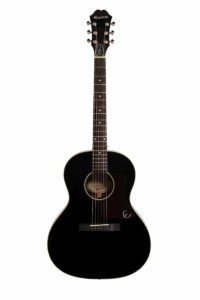 For more information on this guitar, you can check out our Epiphone Masterbilt DR-500MCE review. If you’re fairly new to the realm of six-stringed instruments and are serious about making your life-long journey of becoming a guitar player then you know that you must be equipped with the right amount of determination but also with the right tools that are going to provide you with a kind of ease that will guarantee that your determination will not burn out; and what’s the best place to start than having the best beginner guitar pack at your disposition at such an affordable price. 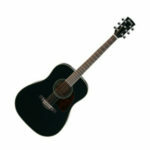 The Guitar Pack we are going to write about is Epiphone PR-4e Acoustic-Electric guitar pack. This pack features everything an entry-level guitarist may need. In my opinion, this guitar pack is the most suitable option you can come to terms with, this pack’s price rate is fairly cheap and you can get this guitar pack without breaking your bank. This package contains the Epiphone PR-4e acoustic-electric guitar, a set of strings, a clip-on tuner, a gig bag, a guitar strap, and the Epiphone Acoustic 15 amplifier. Highlighting a durable quality mahogany wood comes as a surprise when you’re paying this little for a guitar but, nonetheless, the manufacturers decided to award their guitar enthusiasts with such quality. This guitar is glazed with mahogany wood for the neck, the back and sides, supported by a spruce top matching with a rosewood fingerboard with white dot inlays and 20 frets. The piezo pickups provide a smooth shifting of the sound to the PA system or amplifier. Equipped with a set of onboard tuners that helps the players keep their instrument in tune much more easily. In conclusion, this package comes with some sound and durable features that will provide satisfaction for every guitar player given its price rate. The sound the PR-4e produces is remarkably driven by a powerful mid-range strike and a grade of richness from the trebles. This acoustic-electric guitar produces a quality tone even if you are strumming it unplugged or plugged in the audio quality has a powerful sound and is bound to leave a enthusiastic player desire for more. For more, you can read a detailed review of the Epiphone PR-4E. Finishing up our best epiphone guitars list, we decided to review the Epiphone EL-00 Pro because this guitar is worldwide known as the blues legend. It earned its name as the blues legend because it’s mostly picked by blues guitarists of all eras for the compact size it has, the tonality of wood quality, little space between scales and the suitable weight. Regarding the appearance, this guitar is as fashionable as an instrument can be, gorgeously balanced with a distinct touch of elegance which carries the resemblance of an expensive acoustic guitar. It is properly equipped with Grover’s tuners which contribute to making live tuning stability. Offering exceptional playability and somewhat more enunciated intonation Epiphone EL-00 PRO offers more than what you can ask for at this fair price. Highlighting a Fishman Sonitone preamplifier and a pickup system from the Fishman Sonicore allow you to plug this baby in and produce a powerful stage like sound. 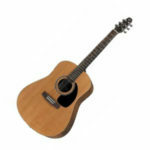 This acoustic-electric guitar provides you with that top-class quality. The saddle underneath has the pickup system of Fishman Sonicore and the Sonitone preamp is installed in the soundhole where you can modify the controls for tone correcting and master volume. What makes Epiphone Guitars special? Hopefully, now you are equipped with some knowledge about Epiphone’s Guitars and you probably already have a clear picture of what your next guitar is going to be. I’ve featured here most of the top-rated guitar that Epiphone has provided the guitar industry with. All the designs I’ve featured here are chosen by acknowledging their practical effectiveness. Guitarists that posses any type of strumming abilities be it a pro or maybe just a beginner are bound to find a tremendous amount of options to pick from this brand. Here I’ve listed some of the most suitable guitars that are a great combo of quality and affordability. Furthermore, some of the most suitable guitars and highly priced acoustic-electric guitar models are additionally included for the skillful players that want to deliver a flawless performance when they hit the stage. I believe that I’ve provided you with enough options for you to decide accordingly to your budget and strumming abilities so you can experience a delightful and authentic artistic experience. I hope this article helped you find the best epiphone guitar.